I am not a concentration camp survivor. Sure, I’ve weathered difficulties during my years. 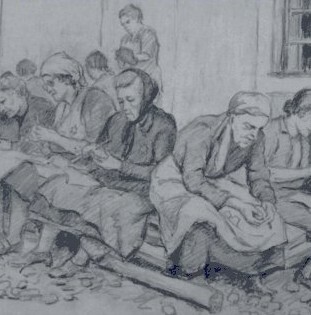 The life-changing stresses of medical training, the indignity and torture of hospital internship, and the indentured servitude of a lengthy medical residency — experiences that pale in comparison to those of the women of Terezin. Still, contemplating their attempts to cope, to normalize life, gave me a reason to pause and reflect. What are the memories that provide comfort for us when we are facing the worst? What lives on once we’re gone? When I was a small child, only one of my grandmothers was still alive. My recollections of her are limited, but include fond memories of southern fried chicken, hush puppies, and fried catfish. (Was everything fried? I cannot recall.) She lived far away from my family and died when I was barely into my teens, so I really didn’t get an opportunity to know her as a person. I mourn that lost opportunity. It’s been over 20 years since I lost my mother. Quite frankly, she was a lousy cook, but I still remember with fondness the dishes she tried to fix for us. She was always better with brownies, cookies, and fudge than with dinner, which was always over-cooked — even the canned peas, which she felt compelled to boil into an oblivion of mush. Sadly, most of her (edible) recipes died with her, as she rarely wrote down any notes about her concoctions. That is a loss that still creates an empty void. Perhaps adding to my existential crisis is the fact that there are no children or grandchildren to receive any handed-down family recipes or lore — nor are there any nieces or nephews in my family. That’s the sort of reality that hits home when you’re already in the throes of a mid-life crisis. My brother-in-law once, without our knowledge, timed my sister and me during our conversations over a 3 day period. His research led to a startling revelation — he found that my sister and I were unable to go longer than 15 minutes without talking about food. If we weren’t talking about something we just ate, then we were talking about what we planned to eat next. Or about something we wanted to eat. Or about a memorable dinner or meal, sometimes from many years in the past. We have since come to realize that food quite literally consumes us — our thoughts, our conversations, our memories. If one believes in reincarnation, after listening to us talk it would be logical to conclude we both starved to death in our former lives. A few years ago I started “Alaska Food & Wine,” a site that was the off-spring of the “Alaska Luxury Vacations” travel agency. The birth of AK F&W came about after a number of people tactfully pointed out that I had developed the annoying habit of bundling far too many restaurant reviews, food and wine event announcements, and other culinary topics into the travel site, to the point they eclipsed travel information. Now after a couple more years, the same tactful friends have pointed out that “Alaska Food & Wine” has gradually been taken over by my recipes, to the point where they have begun to eclipse restaurant event announcements, reviews, and other culinary themes. The solution seems simple enough — create a separate area to house my recipes, a place to keep them from overwhelming other sites. And, as it turns out, a spot that can (hopefully) serve as a repository for my own small, personal culinary legacy. Two problems solved, at least for now. “An Alaskan Cooks” has gradually evolved from my other online work with its birth fueled, in part, by what some would refer to as a mid-life existential crisis. Does cyberspace really need another recipe blog or website? Probably not … but I do. Please drop by and visit “An Alaskan Cooks” — and bon appetit. This post brought tears to my eyes. We all have sources of strength and it’s so important to rely on them during the tough times and to keep sight of them even during the good times. Well-written post, this really got me thinking as well. Like you, food brings back a lot of memories for me too. But I find myself not really cooking for the memories, it really is about doing what we love and enjoy. Because that way we can enjoy every minute of the present!